The core of the Virgo cluster, as seen by the Burrell Schmidt Deep Virgo Survey. The image shows the diffuse, extended of giant Virgo elliptical galaxies, along with a myriad of streams and plumes of intracluster starlight spread throughout the cluster. The black circles are foreground stars in our own galaxy that have been masked from the image. This fall marks the full public release of CWRU Astronomy’s Burrell Schmidt Deep Virgo Survey. Over the course of seven observing seasons from 2004 through 2011, CWRU astronomer Chris Mihos and collaborators used the Burrell Schmidt telescope to conduct deep wide-field imaging of the nearby Virgo Cluster of galaxies. 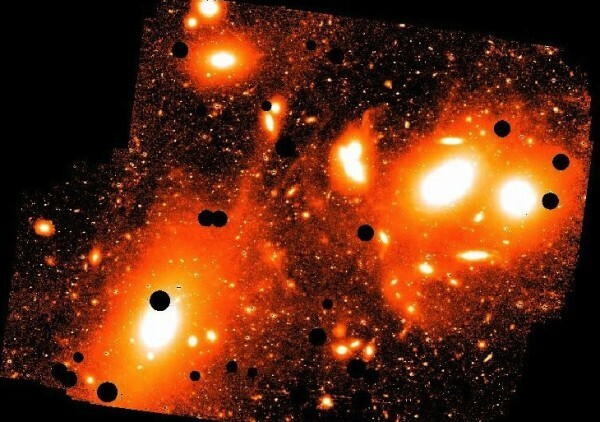 The survey covers over 15 square degrees of the cluster in two filters, providing surface photometry and color information for galaxies, tidal streams, and diffuse light in Virgo down to extremely low surface brightnesses (μB ~ 29.5 mag/arcsec2, or about 1/100 of the brightness of the dark night sky). The imaging is even sensitive enough to capture the faint glow of dust clouds in our own Milky Way galaxy light up by Milky Way starlight. Mihos and his collaborators have been using the survey data to study Virgo’s faint intracluster starlight, comprised of stars torn out of their parent galaxies by the strong galaxy interactions within the cluster. The survey data also shows the changing color of starlight in the outer halos of massive Virgo ellipticals, tracing the changing chemical composition of the stars in the outskirts of those galaxies. A number of extremely large but faint “ultradiffuse galaxies” have also been discovered within the Virgo cluster from the deep imaging. The full dataset is available at http://astroweb.case.edu/VirgoSurvey/ and is already being used by other astronomers world-wide in their studies of galaxies and galaxy evolution in the Virgo cluster.